I love peanut butter cookies. 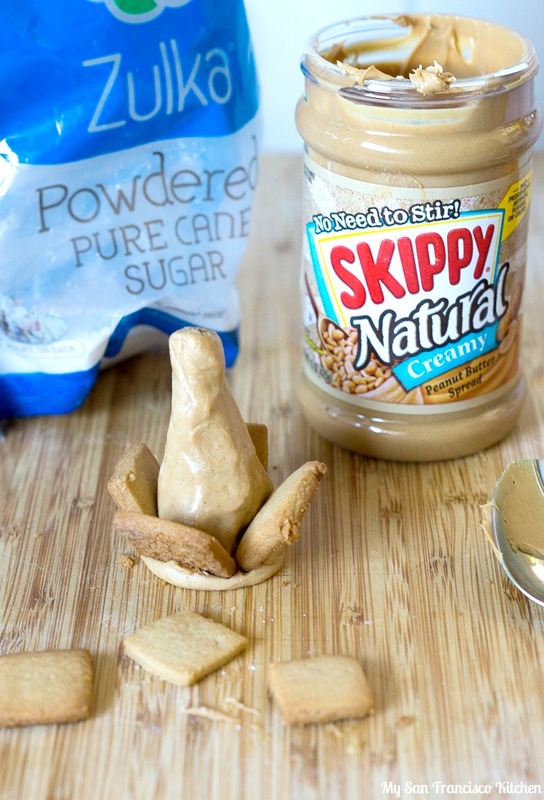 This holiday season I wanted to put a spin on a classic peanut butter cookie recipe from my favorite peanut butter brand to bake peanut butter cookies with, SKIPPY®! After baking my peanut butter cookies in 1-inch square shapes, I arranged them into these peanut butter pine cone cookies. 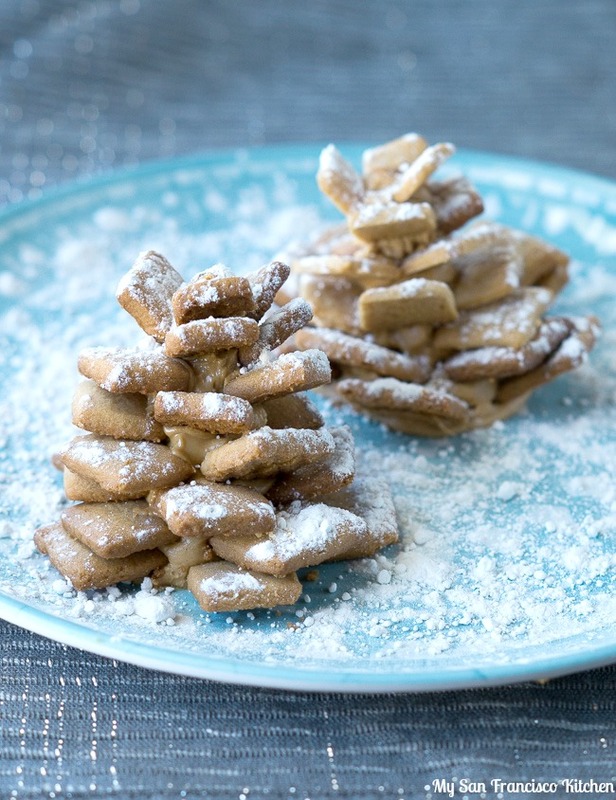 This recipe is perfect for winter, because the powdered sugar sprinkled over the peanut butter pine cone cookies makes them look like snowy pine cones. I got the idea to make these on Pinterest, where I saw gingerbread pine cones. Since I love peanut butter cookies so much, I decided to try the idea with peanut butter cookies instead. I was thrilled with how these peanut butter pine cone cookies turned out. These snowy pine cone cookies are a beautiful addition to the holiday dessert table, and you can even use them as a center piece. 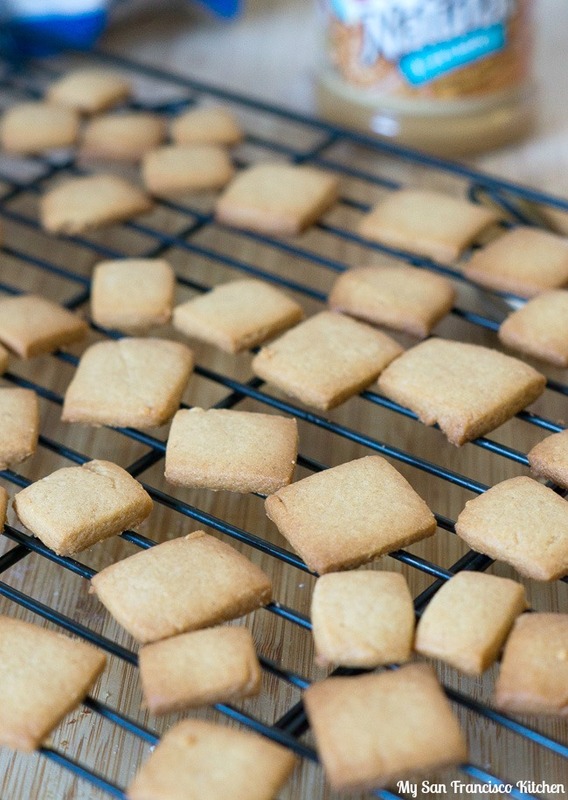 You don’t need a special cookie cutter to make the squares – just a knife. Once the peanut butter cookies are baked, it only takes a few tries of placing the cookies on the base into a pine cone shape before you get the feel for it. The best part is, you can take the peanut butter cookies on and off and arrange them multiple times until you are happy with how they look. 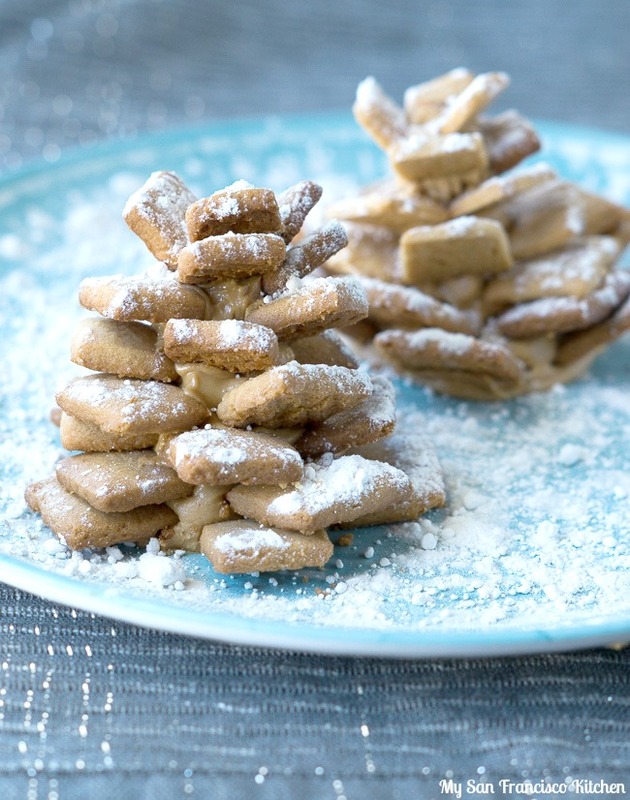 I just left mine on the first try, so you can see they are pretty easy to assemble, and you can definitely make your pine cone cookies look much prettier! 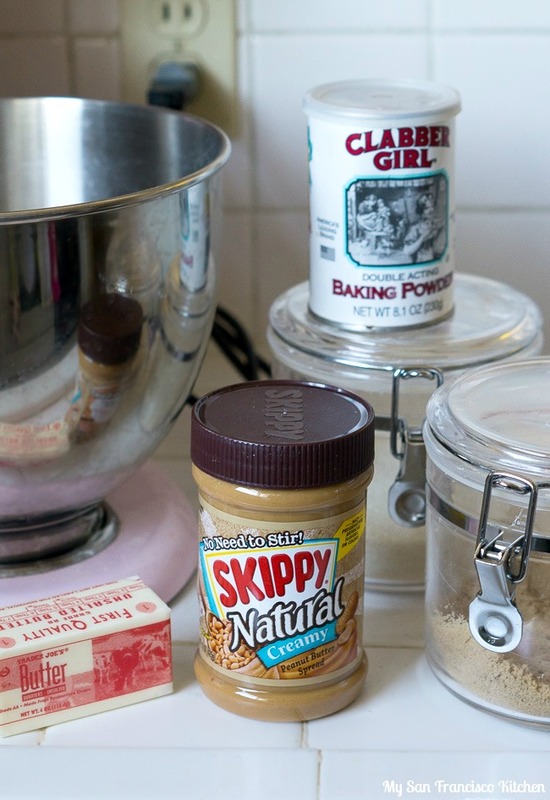 What I love most about this recipe is it’s versatility: SKIPPY® peanut butter comes in many different flavors, and you can easily find them all at Walmart. Here is a coupon for SKIPPY® peanut butter. Let’s get baking! Next time I will make these with the dark chocolate spread flavor! Yum! 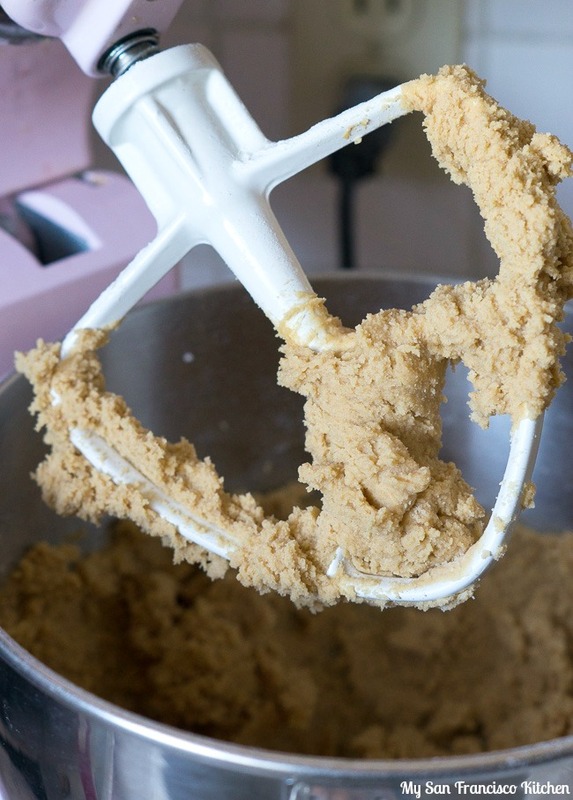 Cream together the butter and sugars in a stand mixer or in a bowl with an electric mixer. Add the peanut butter and continue to mix on low speed. Slowly add the flour mixture to the mixer while mixing on low speed. Roll dough out on a floured surface to ¼-inch thickness and cut 1-inch squares. Bake for 12 minutes, until golden and firm. 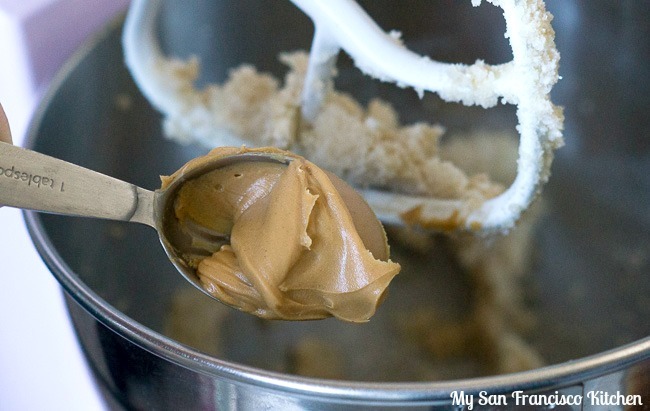 In the meantime, mix 1 cup peanut butter with 1 cup powdered sugar. Form a handful of the mixture around 1 pretzel sick, forming a thicker base at the bottom and a thinner base at the top so it looks like a cone shape (see photo). Use extra peanut butter to stick the cookies onto the pretzels, starting at the bottom and working your way up in a circle. Sprinkle powdered sugar over the pine cones and keep in the refrigerator until ready to serve. Check out SKIPPY®’s website for more fun recipe ideas. This entry was posted in Christmas, Dessert and tagged cookies, holidays, peanut butter, powdered sugar, winter. What a fun idea! I absolutely love how these turned out, and I bet they are delicious as well! I love Skippy Natural. I buy the giant jars at Target. These cookies look fab. I love that there’s extra peanut butter in the base! These are sooo cuuute! I love peanut butter. It’s my soul mate. So adorable! Love this idea!! they looked like real pine cones….these will be fun to make, they are so cute.. These are so great and christmassy. I love that they are peanut buttery, can never go wrong with peanut butter. Take care. Pinned. Can never resist peanut butter. These look wonderful! Hope your holidays are terrific!